Description: During the night of July 26-27, the Union II Corps and two divisions of Sheridan’s cavalry under command of Maj. Gen. Winfield Scott Hancock crossed to the north side of James River to threaten Richmond. This demonstration diverted Confederate forces from the impending attack at Petersburg on July 30. Union efforts to turn the Confederate position at New Market Heights and Fussell’s Mill were abandoned when the Confederates strongly reinforced their lines and counterattacked. During the night of July 29, the Federals recrossed the river leaving a garrison as heretofore to hold the bridgehead at Deep Bottom. 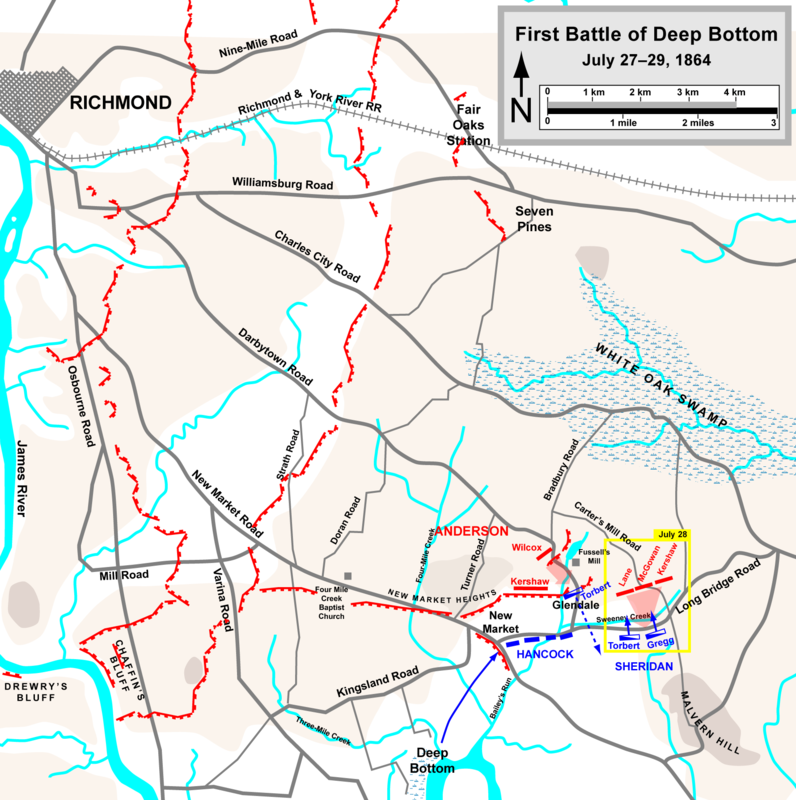 Note: Click to see maps of the First Battle of Deep Bottom, which should help you follow along with the action. Brief Summary: In late June 1864, the brigade of Brigadier General Robert Foster established a bridgehead over the James at Deep Bottom, just north of the Bermuda Hundred lines of the Union Army of the James. Grant’s purpose was to get Lee to extend his lines to cover the approaches to Richmond from the southeast, weakening his defenses elsewhere. This drew Lee’s attention, but his instructions to Department of Richmond commander Richard S. Ewell went mostly unheeded, other than to send artillery to fire into the bridgehead and Union shipping on the James River. On July 23, a second brigade was thrown into this bridgehead and it was expanded to occupy the positions the Confederate artillery had established. And Grant had even bigger plans. A few days later, he told Army of the Potomac commander George G. Meade that he wanted “a demonstration on the north side of the James River, having for its real object the destruction of the railroad on that side.” The railroad Grant referred to was the Virginia Central, and he planned to use a force consisting of two divisions of Winfield Scott Hancock’s Second Corps as well as two of Phil Sheridan’s Cavalry divisions, Torbert’s and Gregg’s, all from the Army of the Potomac. The railroad would be destroyed where possible, and the bridges over the Chickahominy River would be destroyed. The mine Henry Pleasants and his 48th Pennsylvania had been digging since late June was nearly complete, and this operation might also draw Confederate strength north of the James, reducing he Confederate forces east of Petersburg near where the mine explosion was soon to take place. In the days leading up to the demonstration, Lee had ordered Kershaw’s First Corps division to assault and attempt to dislodge the Union bridgehead at Deep Bottom. Some small scale fighting occurred, but no results were gained by the Confederates. The bridgehead still existed. Brief Summary: While the first day of the First Battle of Deep Bottom on July 27, 1864 had been primarily an infantry fight, day two on July 28 saw Confederate infantry battle Yankee cavalry. Sheridan’s two cavalry divisions had been placed on the right of the Second Corps line, and Grant planned to use at least one of them offensively. Torbert’s division would continue to cover the Union infantry’s left, while Gregg’s division utilized a little used country road to attempt to get beyond the Confederate left. The Confederates had their own plan in mind. Joseph B. Kershaw, commanding the combined Confederate forces, gathered four understrength Confederate infantry brigades, Lane, McGowan, Wofford and Kershaw’s own former brigade under Connor, to attack the Union right. Gregg’s cavalry unexpectedly ran into this force. The initial Confederate attack managed to capture one Union artillery piece when a battery was abandoned by its supporting cavalry. The heavy firepower of Union repeaters began to tell, however, and the Confederate infantry were routed, losing 200 men captured. Previously unpublished reports from three regiments of Lane’s Brigade, the 28th North Carolina, the 33rd North Carolina, and the 37th North Carolina, have been published at The Siege of Petersburg Online. Click the links above to read them. The two days of fighting managed to pull all but three Confederate divisions north of the Appomattox River, leaving those three to defend Petersburg. Grant’s “demonstration” did not come close to achieving its main goals, but it definitely created a situation south of the Appomattox River which might be exploited after the mine explosion…which was coming in two short days.